Today is the Feast Day of St. Thomas Aquinas! In honor of that, I thought I'd cover some ground I've been over before, namely, Thomas' role as a model of Catholic theology and his primary focus on Scripture. Perhaps most striking--at least to some--is Thomas' insistence on the priority of the literal-historical sense of Scripture. In short, for Thomas Theology is a Scriptural enterprise. Since he's consistently held out as the model, Catholic theologians should be sure to, likewise, make "the study of the sacred page. . . the very soul of theology" (Vatican II, Dei Verbum, 24). Throughout the ages, Thomas' work has consistently been held out as a model for Catholic theology by the Catholic Church. Consider some of the following quotes from various popes. I've added some italics. While Thomas' importance is seldom disputed, what is often overlooked is the fact that for Thomas, the study of Theology was to be first and foremost a biblical exercise. An excellent overview can be found in Christopher Baglow, "Rediscovering St. Thomas Aquinas as Biblical Theologian," Letter & Spirit 1 (2005): 137-146. You can purchase the volume here (it is full of a number of other excellent articles, including one by my friend and co-blogger, Brant Pitre). Baglow begins by pointing out that, as many scholars explain, for Thomas there is a "unity between sacred Scripture and sacred doctrine" (137). He goes on to cite Thomas Aquinas, who wrote, "Only the canonical scriptures are the standard of faith (sola canonica scriptura est regula fidei)" (141). "Thomas holds that only the literal sense of Scripture is available to theological argumentation. That is because he maintains that all the truths necessary for salvation--the only proper 'content' of doctrine and theology--are to be found in the literal sense of Scripture. It is not that he denies the possibility or utility of the spiritual senses. Rather, he insists on an essential, foundational status for the literal sense. 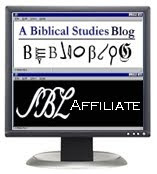 To be legitimate, all spiritual interpretation must be based on the literal sense. This rules out any allegorizing that does not first deal with the literal meaning of the text" (142). Suffice it to say, this is probably not what most people expect from St. Thomas. In fact, Thomas's strong biblical emphasis is positively shocking to many Christians who have never read him. To those who think Catholicism ignores Scripture, think again: this is the man the Church holds up as the model of Catholic theology! In particular, I'd recommend his commentaries on biblical books to those interested in Scripture study. They are an absolute gold mine. I was so blessed to have heard part of your commentary St. Thomas Aquinas on Immaculate Heart Radio this morning. Particularly striking were St. Thomas' words before he died. Could you please direct us to the text of the full quote? Thank you very much and may our Lord continue to bless your ministry. Thank you, Mr. Barber, for posting this wonderful blog. I heard that you were doing a talk on the radio about this, but we do not get Catholic radio in this are of San Bernardino county in CA and I missed out on it. However, I am told that I podcast will be posted soon, so hopefully I get a hold of it soon. Aquinas is my patron saint and I really love him as my spiritual brother. I grew up as a devoted Evangelical Protestant and became exposed to the great history of Christianity that I never knew about when I was studying history in college. With that exposure, i became aware of Aquinas and fell in love with his wisdom and philosophy. I eventually came to the point that I agreed with (though I still never fully understand) nearly everything that I read of his that I was left to conclude (along with my other studies in history) that I was a Catholic at heart. I began the R.C.I.A. process in August of last year and I will be Confirmed this Easter. I am testament to the fact that the Holy Spirit continues to use this Dumb Ox to bring Christians closer to Christ even centuries after his life on Earth came to an end. 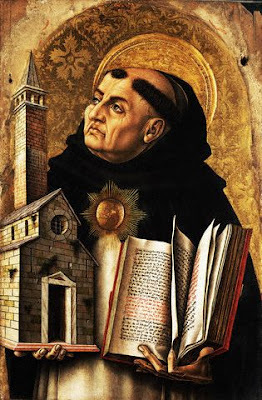 I became a Catholic because of Saint Thomas Aquinas, whom I revere as the Beloved Theologian, and I will remain and grow as a Catholic in part because of him. Forget not that saints can err. One example is Saint Thomas' teaching on Mary's state, that she is not sinless. I don't appreciate excuses made for this teaching, but I do appreciate acknowledgment and acceptance of a saint's ability to err. No saint is so great that he or she should be excused for any errs he or she makes. No saint is, after all, a celebrity.